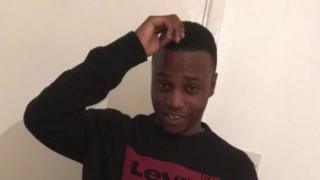 Glendon Spence, 23, from Lewisham, was attacked at the Marcus Lipton Youth Centre in Brixton at about 18:45 GMT on 21 February. A boy, who cannot be named for legal reasons, was arrested in Manchester on Wednesday and charged with murder on Thursday. Another 17-year-old boy was charged with murder on 24 February. A provisional trial date has been set for 12 August at the Old Bailey.